Back home in Lubbock, Dane Stull said he is usually surrounded by people who look like him, who are white. But when he stepped foot in Austin for freshman orientation, one of the first things he noticed was the racial diversity of his future classmates. “Just coming to Austin, you see a wide variety of cultures and people coming together for the better of everyone,” Stull, a mechanical engineering freshman, said. 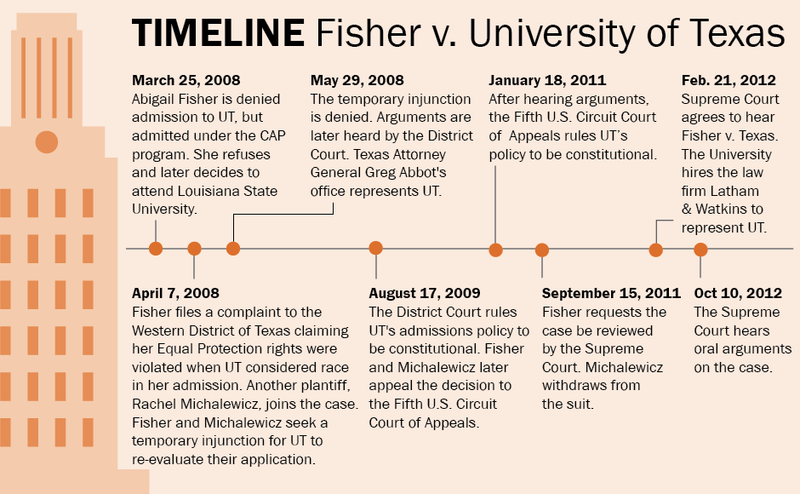 The U.S. Supreme Court will play a key role in the future of UT’s student makeup by ruling on the landmark affirmative action case, Fisher v. University of Texas, this month. A decision could come as early as Monday or as late as June 24. The plaintiff in the case, rejected UT applicant Abigail Fisher, claims UT did not admit her because she is white and not from an underrepresented group. The court will decide whether UT’s use of race as a factor for admission is constitutional or a violation of a student’s right to equal protection. University officials said UT’s use of race does not disproportionately affect any racial group and that a ruling against UT’s policy would make it harder to bring students of color to campus. However, data of recently admitted students shows most students admitted under UT’s race-inclusive admissions process are white or come from high-income backgrounds. Faculty and staff on campus are also worried a ruling against UT could affect their classes and academic programs. UT has two ways of admitting students. Seventy-five percent are admitted under the state’s Top 10 Percent Rule, while the other 25 percent of students are admitted under UT’s race-inclusive admissions process, which considers race among other factors such as student achievements, academics and extracurricular activities. According to documents filed by UT in the case last year, removing race as an admissions factor from 1996 to 2003 caused UT to be perceived as an unwelcoming environment by students of color. Black and Hispanic enrollment also dropped after race was excluded from admissions. UT began using race in admissions again in 2004. In 2011, 48 percent of the incoming class was white, 21 percent was Hispanic, 18 percent was Asian and 6 percent was black. UT has admitted lower percentages of black and Hispanic students through race-inclusive admissions every year since 2007. Additionally, 61 percent of students in 2011 admitted under race-inclusive admissions came from households with family incomes of $100,000 or more. Jill Marshall, co-director of UTeach, a program which trains student teachers who often work in underrepresented communities, said a ruling against UT could hurt the program. Shannon Ratliff, a trustee emeritus of the UT Law School of Foundation, said some organizations may choose to increase financial support to students of color if the court rules against UT to maintain student diversity. Brian Lee of Pflugerville, who attended freshman orientation Wednesday, said he thinks the practice of including race as a factor in admissions is racist itself. Follow Andrew Messamore on Twitter @AndrewMessamore.